Final Fantasy, as a series, has a typical formula for a protagonist. Usually, a Final Fantasy protagonist will sway somewhere between being very jovial and happy-go-lucky (Zidane, Tidus, Vaan) and super serious (Cloud, Squall, Lightning) with infrequent variations. Largely, these protagonists are male and though they have their quirks - or redeeming likeable quality - they all abide by similar sort of traits. This is because it’s expected. This is, sadly, because it sells. Interestingly, Noel somewhat facilitates the role of a typical protagonist formula. He settles somewhere in the middle of the scale, yet is quite well rounded. But Noel is not the protagonist of Final Fantasy XIII-2, no matter what the fanbase at large might have you think. Spend any time with the series and it’s quite plain that Serah is feminine. Serah fights, but that’s not what she does, unlike a more tomboyish female character that stands opposite to the one that’s extremely feminine (Tifa and Aerith, Rikku and Yuna). Serah, at first glance, fulfills the typical Final Fantasy heroine (or JRPG) role - she is the female character who stands behind the protagonist and drives the story forward on behalf of the protagonist when they are reluctant or unable to. For whatever reason the heroine might not be able to help herself if an attempt is made, and it is the want to save or assist her that inspires our hero to action. 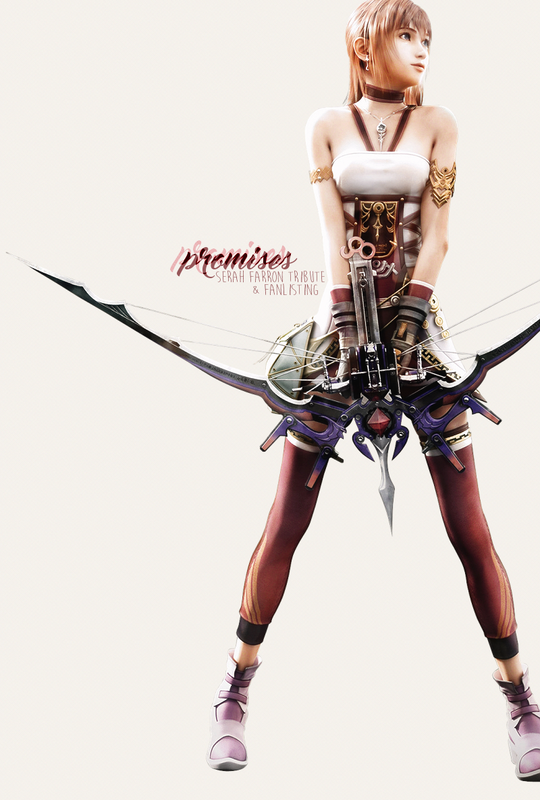 Indeed, Serah serves as this for Lightning in the first game. But, in the second, it is Yeul that serves this for Noel. Serah is separate, herself elevated to protagonist in a rare move by Square and the game industry at large. Serah’s potential is used instead of squandered, and she’s allowed to keep her femininity in the process. She swaps roles with Lightning - as Serah was Lightning’s motivator, Lightning is Serah’s. As a character who was sidelined from being a party member in the original game, it would be easy to continue sidelining Serah. She is, sadly, not a character that sells the genre, because princesses cannot be in the starring role. With someone too feminine, bruising a male ego is at risk, obviously. The remainder of the saga’s story could have been told with Snow, Sazh, or Hope. It could even have been told with someone entirely new, such as Noel. But would it matter as much? Would the emotional impact be there? Not really. The trilogy is, fundamentally, about two sisters and their quest to find each other once again and the extremes they will go to in order to do so. The second game, nor the third, would not have worked without Serah in the titular role of XIII-2. From the moment the series was expanded, Serah’s position and role within it was always assured; because without Serah, there is no first game, and there are none of Lightning’s goals and dreams. If Lightning is to be put in a position to be under Bhunivelze’s thumb, to side with a God when her whole first act is about defying a God, there is only one stake that is high enough for her to agree. Making a character such as Serah the heroine is extremely rare and that’s why it’s so great. Serah is a teacher. She’s smart, perceptive, and kind. She’s motherly. She’s soft and gentle, her personality delved into, truly explored and multifaceted: she’s extremely human in her approach to her journey through time, not detached like those around her, because largely, Serah functions within the NPC world, not outside or above it. Still, Serah still tries her best and manages to save the world, and she does it as herself. She retains her womanhood whilst she’s doing it. That’s extremely important in terms of representation. Push a person hard enough with high enough stakes, and what do you get? A hero. It doesn’t matter about their gender, if they dress in pink, if they enjoy cooking, or if their pivotal want in life is to be reunited with their family and to get married to the person they love. What matters is Serah fights tooth and nail to get it and she succeeds.